Loan-level price adjustments (LLPA), are something most borrowers are completely aware of. But they directly impact the rate and fees you pay for a mortgage. If you’re planning to refinance your mortgage or buy a home, it’s good to understand how LLPAs work so you can set yourself up to get the best deal possible. Simply put, LLPAs are added charges for certain risk factors on a mortgage. They are high loan-to-value (LTV), low credit scores, cash out, investment property, etc. They’re calculated and assessed as a percentage of the loan amount. For example, if the loan amount is $100,000 and the total LLPAs equals 0.25%, the charge would equal $250. Figure 1. 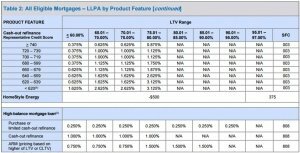 LLPAs for loan-to-value (LTV) and property type. 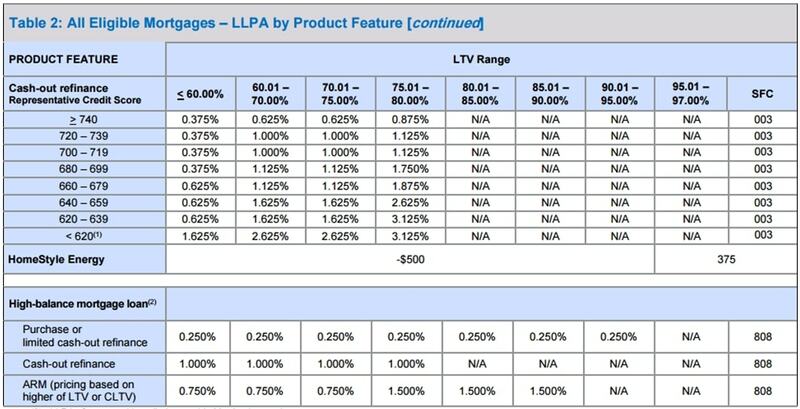 Figures 1 and 2 show the various LLPAs assessed for a conventional Fannie Mae mortgage (the most common type of financing in America today). 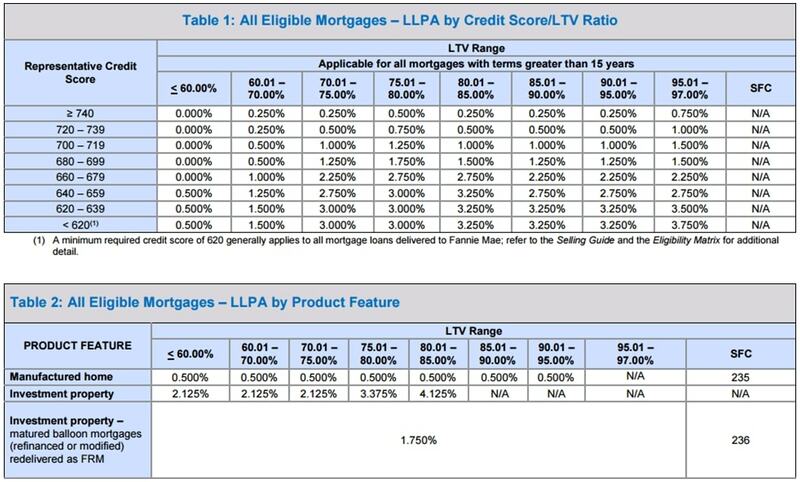 As you can see in the top portion of Figure 1, Fannie Mae assesses LLPAs for LTV and credit score. The higher the LTV, the greater the risk for the lender, so the LLPAs are higher as LTV goes up. You’ll also notice that the LLPAs get even more expensive as credit score gets lower. For example, if somebody with a 96% LTV and a 619 qualifying credit score is assessed a steep 3.75% in LLPAs for those risk factors. Again, if the loan amount is $100,000, the total LLPA pricing hit would equal $3,750. Figure 2. LLPAs for cash out and high balance mortgages. Note that LLPAs stack on top of each other. 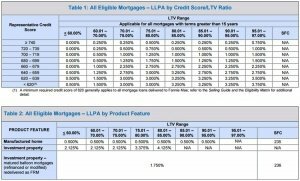 For example, if the credit score is 619, the LTV 75%, and it’s a cash out loan, the total LLPA “hits” are 3.000% for credit score/LTV (Figure 1) and 2.625% for cash out (Figure 2), for a total pricing hit of 5.625%. On a $100,000 loan, that’s a total of $5,625 in risk-based pricing. Though LLPAs work like points, you won’t necessarily pay them as added fees on the loan. The lender may instead absorb all or most of the LLPA costs in exchange for a higher interest rate on the loan. As you can see in Figures 1 and 2, credit score by far has the biggest impact on how much you pay for a mortgage. If you want the best deal possible, it’s important to make sure your credit is as good as it can be. If you have low credit scores (less than 720), be prepared to potentially pay substantially more for fees and/or rate on your next mortgage.